Austrian physician and philanthropist; born in Lemberg April 7, 1807; died in the same city Oct. 12, 1880. At twenty he entered the University of Vienna, and was graduated as M.D. in 1835. He began the practise of medicine as house physician to a noble family in Gwazdziec, near Kolomea, Galicia. In 1845 Beiser removed to Kolomea, where his advice was much sought. He showed his sympathy with the Liberal movement at that time by offering his house to exiles from Russo-Poland, and was himself a deputy of the Roda Narodwa, or People's League. This attracted the attention of the Austrian government, and Beiser was banished from Kolomea to Zolkiev. 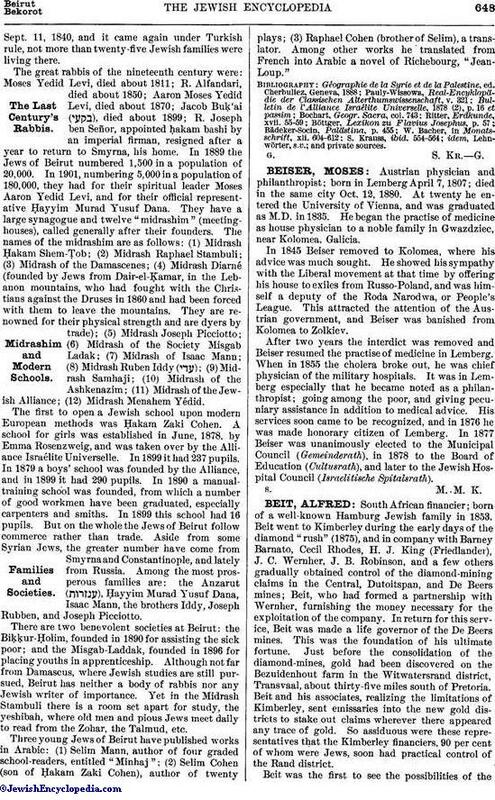 After two years the interdict was removed and Beiser resumed the practise of medicine in Lemberg. When in 1855 the cholera broke out, he was chief physician of the military hospitals. It was in Lemberg especially that he became noted as a philanthropist; going among the poor, and giving pecuniary assistance in addition to medical advice. His services soon came to be recognized, and in 1876 he was made honorary citizen of Lemberg. In 1877 Beiser was unanimously elected to the Municipal Council (Gemeinderath), in 1878 to the Board of Education (Cultusrath), and later to the Jewish Hospital Council (Israelitische Spitalsrath).